The first secret to getting a dense, chewy texture is to start with melted butter. Melted butter is one of the things I love about this recipe. No worries if you forget to let your butter sit out and soften. Just stick it in the microwave or in a saucepan and let it melt. Melted butter creates a denser, chewier cookie. That’s tip number one. 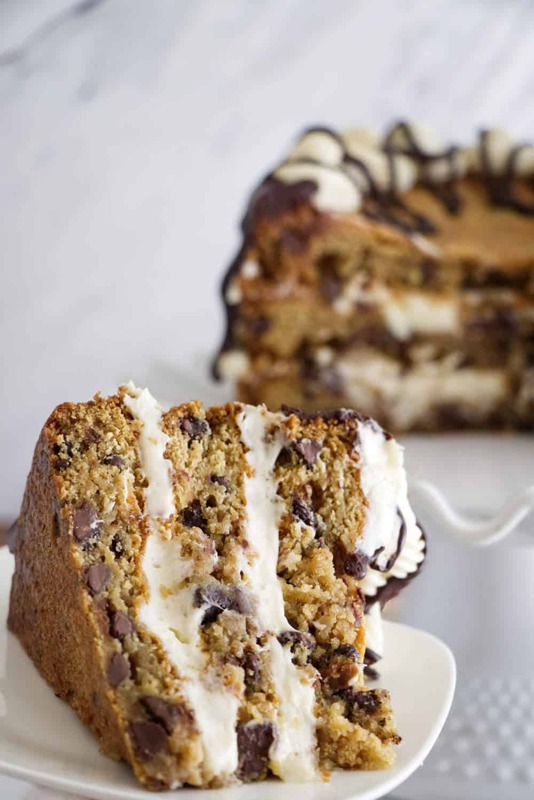 So go get some dollar store cake pans and make this cake…..eer….. giant layered cookie for someone. If you love chocolate chip cookies you are going to fall for this monstrosity. 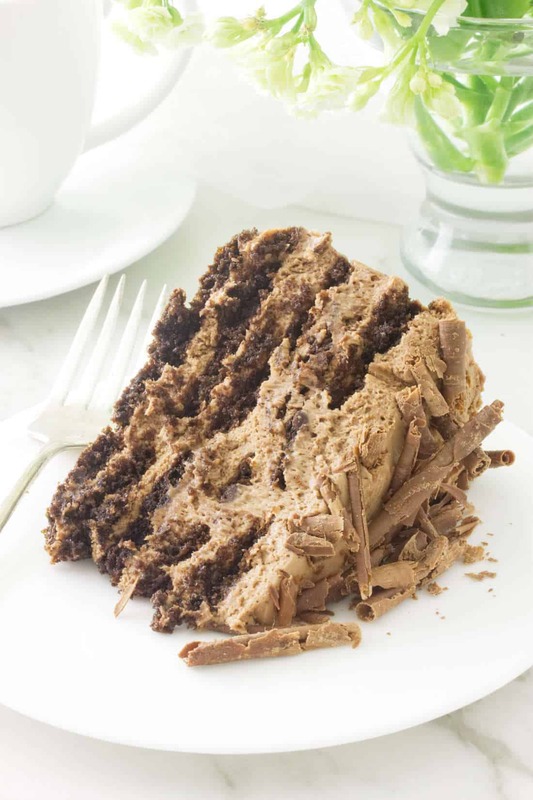 It makes a great birthday cake for that picky person who doesn’t like cake. Heck, it even makes a good birthday cake for a cake lover. As long as you’re mind is on chewy, gooey, over-sized chocolate chip cookies, check out this copycat version of the Levain Bakery chocolate chip cookie. 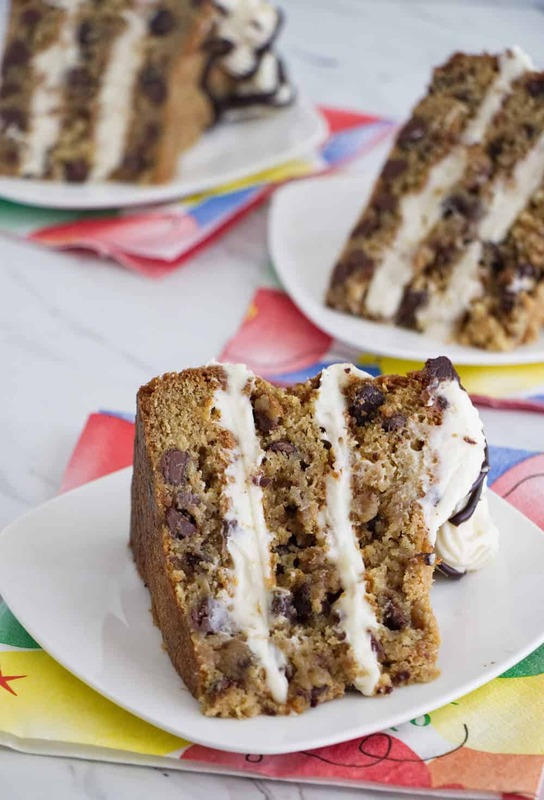 Check out our video above and see how easy it is to make this chocolate chip cookie cake with cream cheese frosting. We used a large open star tip to decorate the top of the cake. If you don’t have a star tip, you can put some frosting in a sandwich bag and cut a small hole in the corner then pipe dollops of frosting on the top. Have you made any of our recipes? We would love to hear from you. Drop us a comment below and snap a photo then hashtag it to #savorthebest on Instagram and Facebook. HI I am making 2 cakes could I make this 2 days before -will it lose moistness etc by doing that? 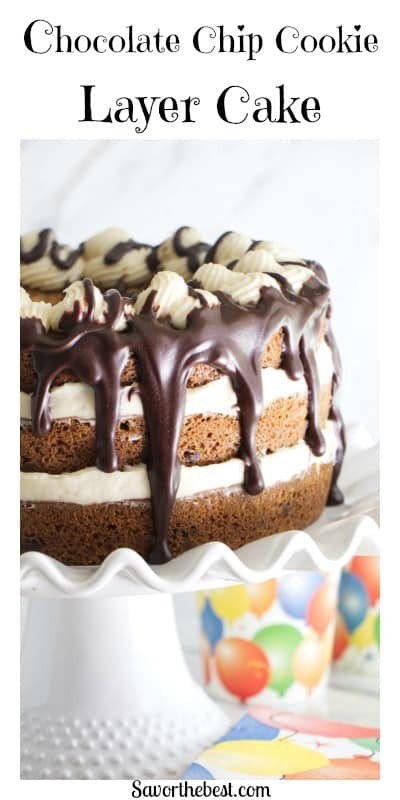 Hi I want to make this cake, looks so yummy! All I have are 3 9inch pans… does that affect the cooking time or do I need to tamper with the recipe to make more? Thank you! I am assuming you used 9-in cake pans but I have 3, 10-in pans I’d like to use. Should I be preparing more batter or just use the amounts specified and expect the layers to be a little thinner? Hey Kristen, I used 8-inch pans. A 10-inch pan holds very close to twice as much batter as an 8-inch pan. If you want to use the 10-inch pans then I would double the recipe. This is probably a silly question, but is the 2 ounces chocolate unsweetened baking chocolate or any old chocolate bar? Thanks!! I’m making this for my husbands birthday today!! Angie that is not a silly question at all. I am glad you asked it. That helps me clarify the recipe better. Use semi-sweet or dark chocolate for the ganache. You certainly can use any old chocolate bar but if you use milk chocolate then the ganache will be a bit thinner. Of course, that could be rectified if you cut back on the cream by a tablespoon or two. Happy birthday to the hubby, this makes a really fun birthday cake!! Do you refrigerate this because of the cream cheese frosting? Food safety practices will advise you to keep it refrigerated if you don’t eat it within 2 hours. 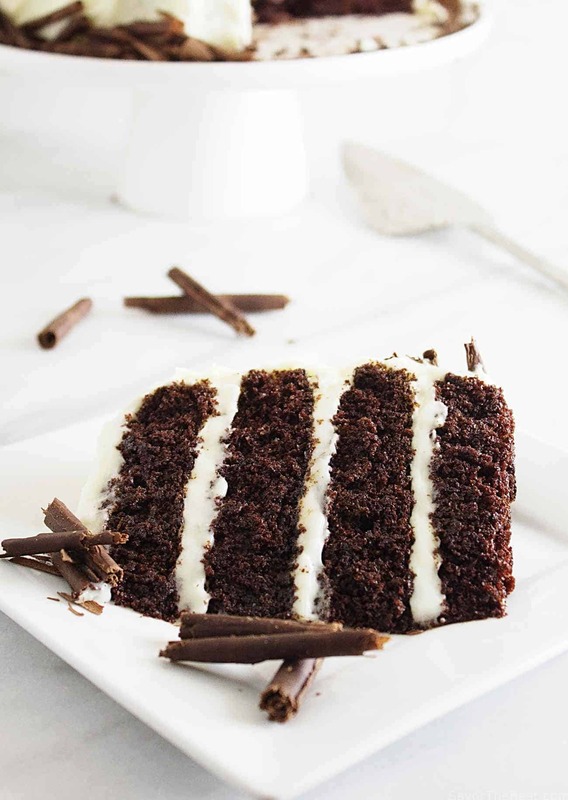 If you keep it in the fridge then I recommend you take it out of the fridge 2 hours before you eat it because the cake and the frosting tastes better when it is at room temperature. I personally will keep cream cheese frosting out for 6 to 8 hours. Sugar acts as a preservative so I feel pretty comfortable with leaving it out longer than 2 hours. 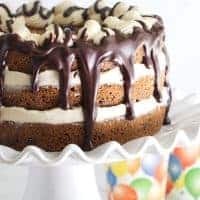 I plan on making this for my Daughts Birthday but was wondering if you could make this as a 2 layer cake instead of the 3 layers? Hey Katie, The baking time would be different if you put the batter in only two pans. I haven’t tried that so I can’t say for sure how it would turn out. I would recommend turning the oven down to 325° and (I’m guessing here) probably bake them for 30 to 35 minutes. Just start checking them after 30 minutes and bake them until they are golden brown on the top and around the edges. The reason I would turn the oven down is so they don’t burn on the edges during the longer bake time. Make sure you use cake pans that are two inches deep. I hope that works for you. Happy birthday to your daughter!! This cake sure looks stunning! I’d love a slice right now. A great birthday cake idea for the chocolate chip cookie lover in the family. That would be most of my family. We’re not really cake eaters, but sure could put a hurt on this! I am drooling over this cake! You had me at chocolate. Looks incredibly delicious. woo hoo, I hope you love it Ann!! Oh wow, this is like my dream cake!! It’s so beautiful and I’m obsessed with chocolate chip cookie anything, especially when it’s able to be made as a birthday cake! Thanks Annie, it’s definitely an obsession! Oh my word, this cake is outstanding! This is definitely a cookie lover’s dream come true 😀 Pinning! Oh Thanks Tammy, we think so too. Oh! My! Gosh! That is one heck of a chocolate chip cookie cake. 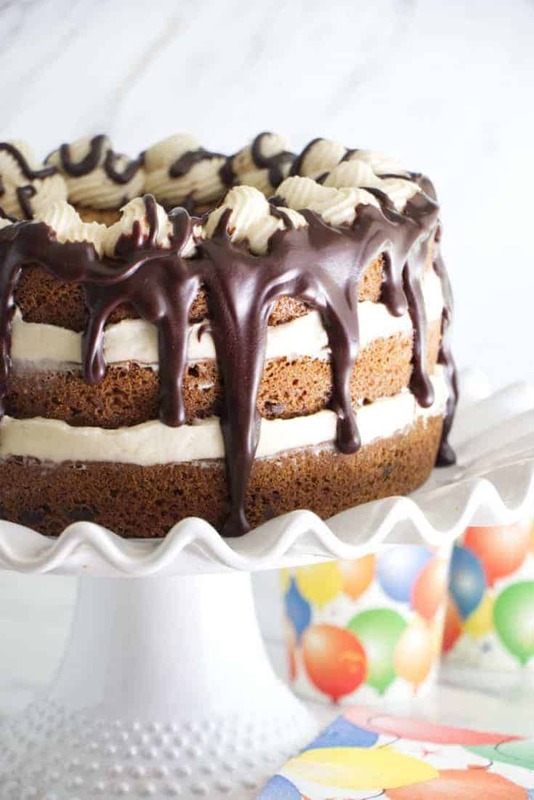 It would make a perfect birthday cake for all of the chocolate lovers. This is one cake that I couldn’t resist. I love how you decorated it too. I’ve got four grandsons who are chocolate chip cookie lovers. They would go nuts over the cake. Yes Marisa, this makes a great birthday cake, especially for those chocolate chip cookie lovers! Oh wow, this cake looks over the top amazing. My kids would love this as a birthday cake. This would also make a great cake for a family gathering. That cake looks soooo delicious! 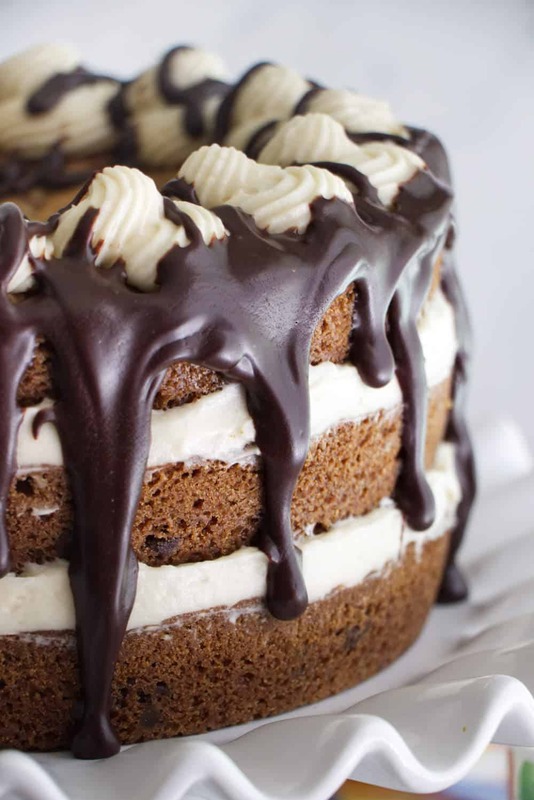 The frosting and ganache looks killer. Perfect cake. 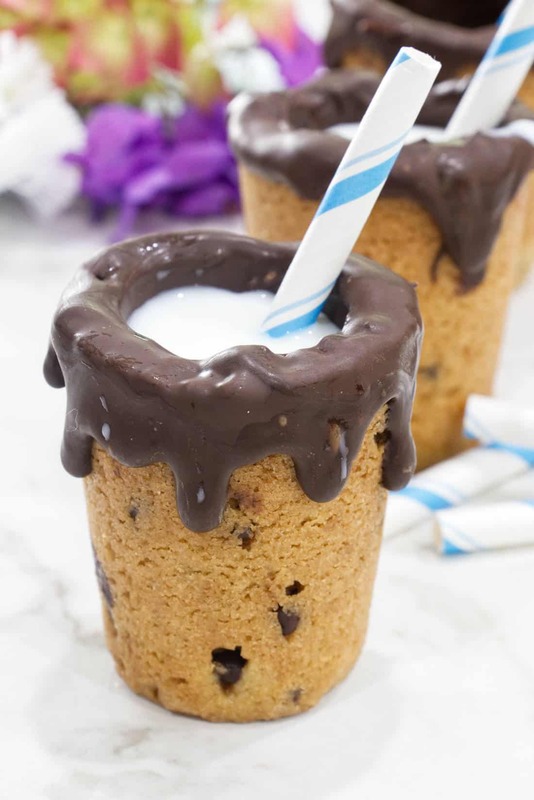 This hits my chocolate chip craving for the week! I’ve had a tough case of the chocolate chips this week – did two posts featuring them. I love that you used cream cheese icing! Thanks Noel, it sure took care of a lot of our friends’ cravings too!! Chocolate chip cookies are a big favorite around here, the softer and chewier the better. 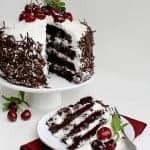 This cake looks terrific, I wish I could try some right now. This cake looks perfect!! I love cookies and cakes, and I love how you combined the two! I am so making this for our next gathering!!!!! The cake looks so moist. 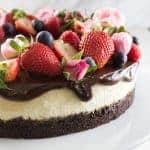 Plus with the cream cheese frosting adding — I will be in heaven with this cake!!!! Pinning to try soon. Thanks Mirlene, I know you will enjoy this. It is a big hit at any gathering.